Jaylen did kick his leg out, but Korver was running into him anyway. #Celtics needed to score on that last possession. Jaylen had an open 3 and just missed. CLE 97, BOS 90 3:54 left. CLE ball. That was a big missed 3 by Jaylen, would've cut it to 4 and put some real game pressure on the Cavs. 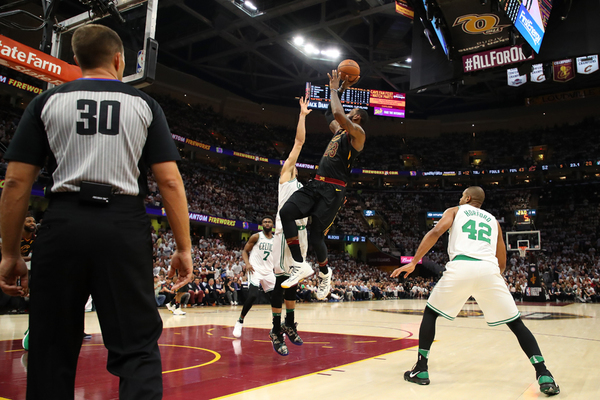 It's Terry Rozier, a point guard from Youngstown, going up against LeBron, an everything from Akron, in a critical conference final game. Looked like LeBron hurt his right leg but now he is fine it seems. Jaylen Brown with just four points since his huge first quarter. Cs will need him to get it going again here in the fourth. #Celtics end 3Q on a 12-6 mini run, trail #Cavs 83-73. James 32, 7 reb, 7 ast, Hill 18. Green 14; Rozier 23, Brown 18. Tatum 11, Morris 10, Horford 2. Man, Terry Rozier is making some shots tonight. The 3 at the end of the quarter there gives him 23 and pulls the Cs within 83-73. LeBron taking a seat for the first time. 57.3 left in the third. #Celtics probably had no issue with Jeff Green shooting an open 3, but he hit it. CLE 80. BOS 65 with 2:12 left in 3Q. "Where's the soup, JR?" sign spotted. CLEVELAND – Cavaliers forward Kevin Love has been ruled out of Game 6 after a head-to-head collision in the first quarter, the team announced. Love knocked heads with Jayson Tatum and fell to the floor, clutching the back of his head. Tatum appeared dazed at first but continued playing. Love exited the game with 6:58 to go in the first quarter. At halftime, the Cavaliers said he was still being evaluated for a possible concussion, but wouldn’t return as a precaution. Love has a concussion history, having suffered one in March and another during the 2016 Finals which caused him to miss a game. He hadn’t scored in three shot attempts when he left the game but had 4 rebounds in 5 minutes. No foul trouble for either team. No one has more than two fouls. Four fouls on the Cs. Cavs shooting the penalty for the final 9:24. Kevin Love is being evaluated for a concussion and won't return, per Cavs. Kevin Love will not return to the game. Tatum and Horford a combined 1 for 7 in the first half. LeBron played the entire first half and had 25 points, 5 rebounds and 5 assists. 9 turnovers for the Celtics.